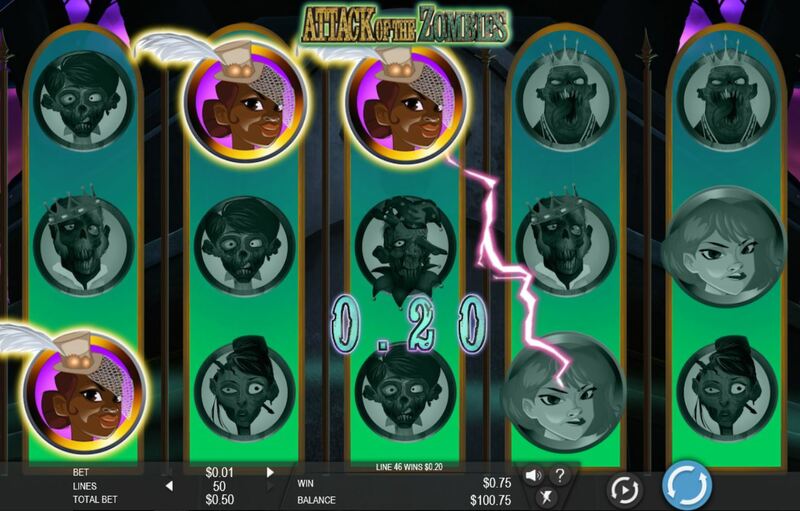 Attack of the Zombies slot has 5 reels, 3 rows and 50 paylines with a decent RTP of 96.37%. The symbols are all single and there are 'brain' Wilds on all reels which don't multiply. 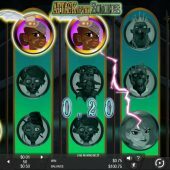 You get 10x stake should you line up 5-of-a-kind (5OAK) of the Wilds, and similarly all the 4 top-paying symbols also offer 10x stake for 5OAK. The graphics are smooth and you when you get a win comprising of certain symbols you get a rather pathetic 'Zombie' appear over the reels with an equally pathetic 'roar'. In-play there is actually a 'win feature' which randomly appears and isn't actually described in the paytable, but you seem to get a 3-reel or 4-reel combination of the highest symbol with Wilds and the last reels spin slowly to possibly add more to the win line. At first I thought it was just an animation like the pathetic Zombie but it's actually preceded by a bar of white light over the middle row of the reels. Attack of the Zombies slot has bonus scatters on all reels and 3 or more trigger a free spins round. There is no limit to the spins because on reel 3 there is a bottle named 'Antidote' and when this appears it will in turn transform the 4 top-paying symbols into Wilds for the remainder of the spins. Obviously this means no retrigger and you are in essence hoping you will get 3 bottles in quick succession to make 3/4 of the possible extra Wilds, because the fourth time the bottle lands and transforms the last symbol into a Wild there is only 1 free spin left, then the round ends.